4th body of open water this year – the Neckar (my goal: 25). No 5 – without fotos – my 3 min. 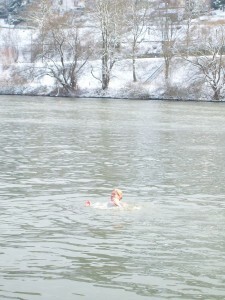 ice dip in the Waidsee in Weinheim beginning of Febr. – there was hardly any free spot to get into the water – basically the whole lake was frozen over. 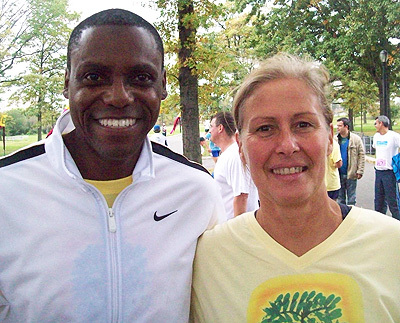 During a short visit to New York to honour the Mahasamadhi anniversary of my teacher Sri Chinmoy on Oct. 11th, I had the good fortune of meeting once again Carl Lewis (“Athlete of the Century”), who has been a supporter of and spokesman for the World Harmony Run since its inception back in 1987. Carl has launched a new project FitForever.com – the ultimate online fitness tool and community – and everyone is welcome to join! Running is fun again now that temperatures are beginning to drop. (I basically hadn’t run since my slow 12 hour run in Basel in May.) I love running in the crisp autum air, with brightly coloured leaves all around, and even now, in misty, slightly depressive November. But with my extra kilos now, I have become quite slow. Kastura, a friend, has given me some tips how to get faster again. Next goals: Heidelberg half marathon end of April, then 6 hour-race in Nuremberg (March) and 12 hours of Basel in May. For swimming: 12 hours, Zurich indoors, on March 1st, 2010. 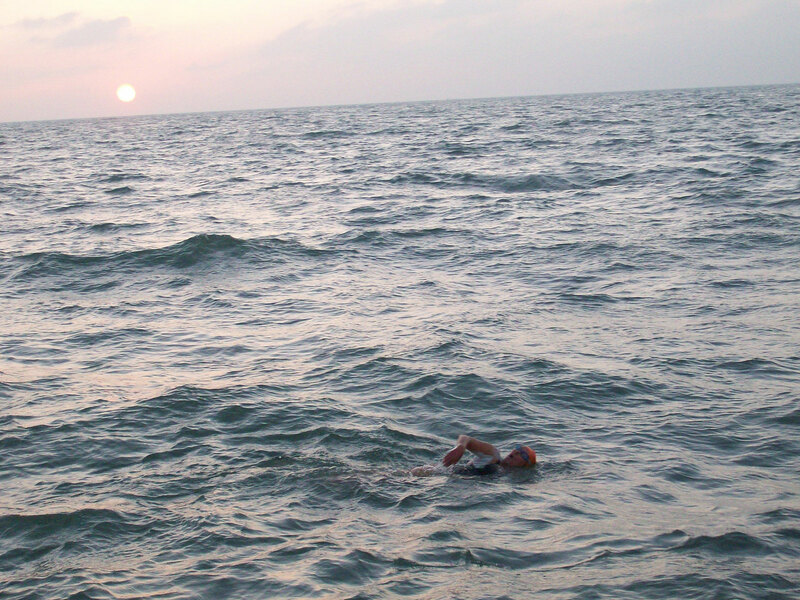 Since our English Channel relay I hadn’t been swimming at all. The indoor pool is still frightening me with its warm temperatures, but I will have to start training for speed, technique, and endurance soon. The first cold dip in the Neckar this season was on Sunday, Nov. 15 – must have been way below Channel temperature already. Today (Nov. 17th) an article about our English Channel relay appeared in our local newspaper. Feels a bit out of place for only 3 hours 21 min. of swimming in my case, but it was a great adventure with a lot of oneness in our international team – which may be much more important than just doing great things for yourself! And if anybody gets any inspiration from it, I am very happy! The first 2 successful Channel crossings of the season have happened: two relays, on June 13th and 18th (see Dover life). Today a couple of pilots went out with their swimmers (maybe around 4 a.m.?) – and I was glued to the screen, following the little dots online via ship-tracking as far as they show up (about halfway to France) while working on my website business. Today was only the beginning of the neap tides (maybe even still spring tide), meaning the current was still strong. The only thing I know right now: Alison`s relay team on Roco did it, getting swept way past the Cap towards Boulogne, but then turning towards France in a sharp angle and soon afterwards touching land. “Nice and sunny, wind 3/4” Nick Adams wrote 10 min. before his last turn in the relay. The German swimmer, Peter Hücker with Andy King, was swept quite a bit East in the beginning, much more so than the other boats, but with the changing tide made a sharp angle South. I thought it might be a variant – making a bigger curve in the beginning to avoid getting swept past the Cap. He took very long to reach the halfway point, and then the boat disappeared from the screen. Later I heard he had to abondon the swim. So unfortunate! So much preparation – and that’s it for this time! My training is still too easy for a Channel swim – it’ll be next year – but I did my first 5 hours on the weekend – split in 3 sessions, that is. Pool, pool, lake. For some fun and leg exercise one lap with fins in the lake. How I enjoyed the open water finally! After last year’s endless hours in the lake and Dover harbour I have long been enjoying the luxury of clear, and in the mornings pretty empty pools where you can see the bottom, with the sun painting dancing patterns on the turquoise floor – and of getting tanned also on the front side by the reflected sun. If the weather was good enough for the non-heated pool to open, that is (at 9 a.m.!). Another luxury of beeing self-employed – I can take my time off when I want to, mostly. 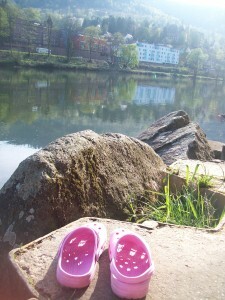 Today was my first dip in the Neckar (or any kind of open water) since January – 17 min. in 8.5°C (47/48 Fahrenheit), with the sun out! Only breaststroking in the yacky water on the spot against the current. I totally enjoyed it – thanks Pragya! I would love to do it everyday by myself, but I am afraid people will call the water police if there is noone to watch me and make sure I am fine. It happened in winter – one Sunday I was almost determined to go in by myself after running, after a friend had not shown up, but on my run home along the Neckar I suddenly saw plenty of police and an ambulance, and when I asked what it was all about they said they were looking for a person in the water and asked if I had seen someone. A skipper had reported a person going into the water and suspected suicide. I asked if there were any clothes on the shore and when they said no, I said, well, probably someone went for a polar bear dip and had gone home by now. But they were not convinced. A bit later at home, coming out of the shower, I heard helicopter noise right in front of the house over the Neckar – they were still searching! Imagine to have to pay for such a rescue operation!